it's been a while since i've had an actual key chain. i once used key holders or coin purses that could hold my ID, credit cards, and money until a friend told me that i was ruining my car's ignition with my heavy key chain. so i removed my car key from the rest and have been carrying them around separately like this ever since. i'm afraid i'll one day lose my car key. so...i'm leaning towards a bright pom pom, because it's light yet substantial enough that i could feel for it and find it in my bag. plus, it's just cute. what's your key chain style? what are you currently carrying? btw, there is some truth to what my friend said. eight keys or less and you're fine. anything more (or key chain/charms equivalent in weight) and you can prematurely wear down the ignition switch resulting in intermittent starting problems. i still have the dealer tag on my car key! i think it's time for a key chain. I need a really cool one... Right now I'm sporting a really boring key ring... Ha! cute key chain. I got told at the oil change place to not add any more keys to my key ring. I have my car key by its self and 3 other keys. Which they all share the same clip on my Amy key chain. I've got a little pewter boot that I was given when I left working for the RCMP, and another key chain I got from an STP fuel injector system bottle :P and probably more keys than's reasonable because I have keys to both my home and vehicle, as well as my parents'. I have a hard enough time finding the darn things as it is in my purse, if I separated them I never would heh. Keychains are a fun opportunity to express ourselves. I collect 'em from places I go, like the Rock 'n Roll Hall of Fame in Cleveland where I got one that looks like a 78rpm record-adapter. It's true about the harm to car ignitions (GM tried to blame its recent problem on that), so when I learned this, I put my car and motorcycle keys on their own separate chains. 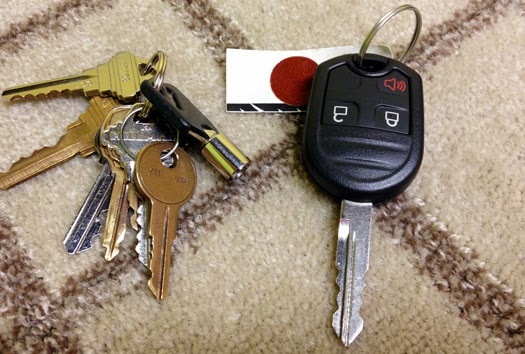 My other keys go on another joint chain. key chains are so much fun, i have a little fur tail for mine! These are really cool collection for keychains. LuLu*s Fashion Face-Off. Team Lace. color your spring with Firmoo + GIVEAWAY. a week of white denim. spring casual. a week of white denim. black + white. east vs west [coast] style. white denim. a week of white denim. shorts. east vs west [coast] style. lace. feel the sun on your skin. east vs west [coast] style. pastels. LBD + pop of blue. east vs west [coast] style. neon.